Allyn Gallagher is a typical 12-year-old with an annoying younger brother, and a crush on pop singer Darryl James. The adventures begin even before Allyn’s mother and Aunt Georgette take the two children to Ireland for a vacation. Nine-year-old Mitchell accidentally sets fire to a confessional, starts a food fight in a pizza parlor and unleashes a reptile on the plane. At the airport, Allyn overhears two criminals planning a drug smuggling operation. Enlisting the help of her brother, the two children begin compiling clues and a dossier on the criminals. Crossing paths with the criminals throughout Ireland, Allyn discovers that her beloved idol, Darryl James, may be involved. Alternating between comedy and mystery, the reader is introduced to several regions of Ireland: Donegal Country and fishing villages to the north, the busy city of Dublin to the east and the Cliffs of Moher in the west. Through the course of the tale, Allyn and Mitchell grow closer, and learn to appreciate each other. 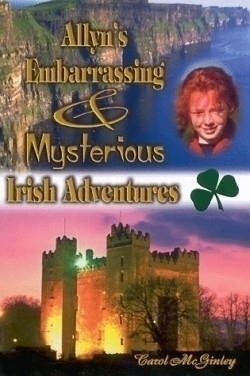 Entertaining and never didactic, Allyn’s Embarrassing & Mysterious Irish Adventures combines history, geography, and a strong anti-drug message, in an engaging storyline. This fast-paced story is sure to delight 9- to 12-year-olds. Includes 18 photographs of Ireland.